Four cows need help urgently! We had such an amazing time last Sunday, during the first installment of my 3 part Animal Communication workshop with the cows. I’m doing a re run of last Sunday tomorrow, for a mum and her son who had a bug last week and couldn’t be with us back then. I’m really looking forward to share this very special time with the cows with them tomorrow! I’m very excited to work with children on this. It’s amazing to witness their natural ability to communicate with animals. They seem to have this inner closeness to animals. They just look at them in the eyes and they feel what’s going on instantly. It’s beautiful and it gives me a lot of hope for the future too! I’m deeply in debt for the herd of dairy cows who guided me patiently through the maze of telepathic communication with animals. I facilitate Animal Communication workshops with them on request on a regular basis and half of the money I receive through these workshops with the cows go towards a Cows Fund to create something nice for them through a non farming related project, for instance finding them a retirement home and being able to get them there. My first project is an emergency: I’m currently trying to rescue four cows who are scheduled to go to butchers in a few days time. The farm who owns them is in the middle of deciding wether or not they will let them go for free. I have contacted a few animal sanctuaries who might decide to have one, two, three or all of them, but it all depends on the farm gesture of kindness towards these animals (they could get £700-£800 per cow from butchers). Some of them are pregnant and they all have mastitis. They are lovely, still have their horns on and would probably need to be hand milked for a while. Dairy farming is not a particularly kind business. Farmers tend to disconnect from their hearts when they go in “farming mode” and have to make such decisions. Then they suppress it down somewhere and it haunts them for a long time. They are in a very difficult position too. I feel it’s important to support them to stay heart centered at all times and help them when they are trying to do their best with the situation they’ve got, which is not pretty . It’s very hard sometimes but I try to be non judgmental and to respect the farmer’s relationship/connection with the animals he is taking care of. I really don’t want to create another division as in good vs bad, I believe that every time you launch a war with something outside of you then you create a war inside yourself as well. Farming badly needs heart centered people at the moment and they are the ones who struggle to last very long because they can’t handle the pressure, coming from everywhere. 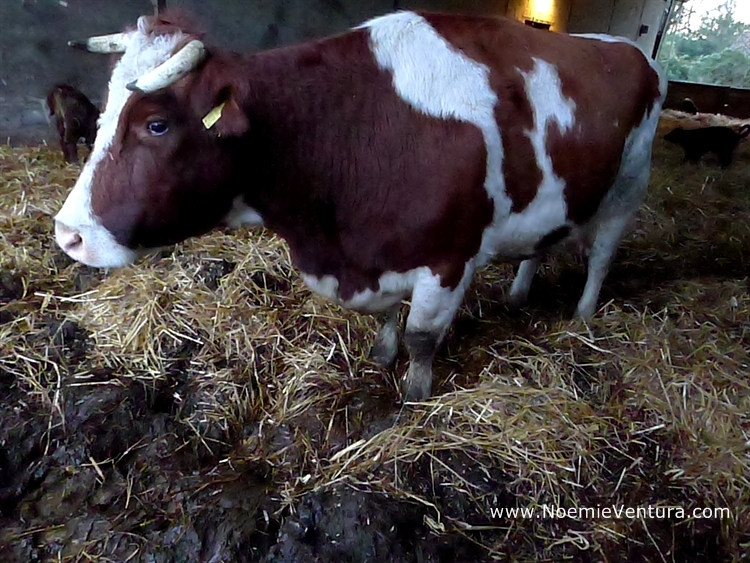 I’m really hoping that by getting more and more people to connect with the cows they will develop their own relationship with them, and get involved with farms to give them a gentle push so they can develop a new way of farming animals: on a very small scale and with a harmonious relationship with the cows. I feel it’s important to not desert the cows and to be by their sides, to remind farmers/carers what the cows want and to try to alleviate the cows suffering. It’s not easy but it’s important to be with them and try to help. A lot of the time there is not much we can do, but I feel it’s important to not give up and try again and again… eventually it will work! So I hope that we can find a place for at least one or two of these cows, to give them a second chance to heal their traumas and to end their life in peace so they don’t carry too much pain/fear with them. I’m asking you to help me here via donating some money that will go towards the transport of these cows if the farm agrees to let them go for free. I need to be prepared as if they do agree we will have to act quickly as the farm want them gone asap. If they don’t agree to let them go for free, then I’ll have to see. I don’t really want to buy them, I would rather that these four cows become a symbol of Hope, a shining example of the beauty that arises when humans choose to act from their hearts instead of their calculator/brains. Of course every single life matters but I don’t want to become the soap that makes a farm look and smell good instantly while receiving money for it! It has to come from them otherwise it doesn’t mean anything. I’m happy to find safe retiring homes for their dairy cows but I want them to participate too! I know that they can afford it and it would be such a more powerful message if the farm agrees to allow their cows to retire in peace instead of just killing them for money. I truly believe that if we want to change farming we will have to change it from the inside. We need to understand how the whole machine works so we can see how we can turn it into something more fair, more harmonious and beneficial for the animals and humans. So if they were to refuse to let them all go for free, then I’ll be very sad and disapointed but I’ll have to accept it and try again another time. In this case I’ll either refund you the money you have donated or it will go towards this Cows Fund to finance future rescue projects. As I work with farmed animals on a regular basis I do often come across opportunities to rescue them. I do my best to always do so, whenever I can, but because every time it’s an emergency situation I need to have access to money quickly to get the animals transported to a sanctuary, for example, or to get a vet to come and help. I would never be able to afford it on my own, which is why it’s crucial that I get together a fund to be able to act quickly. Thank you for taking the time to read this and if you want to donate you can use the Donate Button below, thanks! ← Mother’s Day with the Cows!